My family loves brownies. Loves. In fact “love” is probably not a strong enough word to describe Hubs’ deep and profound devotion. I think he even prefers brownies to cookies, which to me is downright un-American. But like a good little wife, I try to accommodate his preferences, at least occasionally. I haven’t done much baking since we did our first #WHOLE30 in April of this year (2016) because (as I’ve noted on a few occasions), we’ve been pretty successful at maintaining the #WHOLE30 lifestyle, even through some tempting and challenging situations. But Hubs, in his wisdom, anticipated similar if not greater temptations arising when we were invited to a couple 4th of July potluck parties recently. So he suggested I create a paleo-correct brownie recipe we could bring along to those parties, “so I won’t be ‘forced’ to eat a bunch of unhealthy desserts.” Note his use of the word “forced,” as though one is obligated to eat 2 or 3 desserts at every party one attends. I tried to make the argument that he could actually attend the parties without indulging in any desserts, but that argument fell flat. And since we’re not currently doing #WHOLE30 (which would certainly preclude the consumption of even paleo-correct brownies), and because he’s such a wonderful husband, I figured baking a couple pans of brownies was the least I could do. And I set out in search of a paleo-correct brownie recipe I could live with. 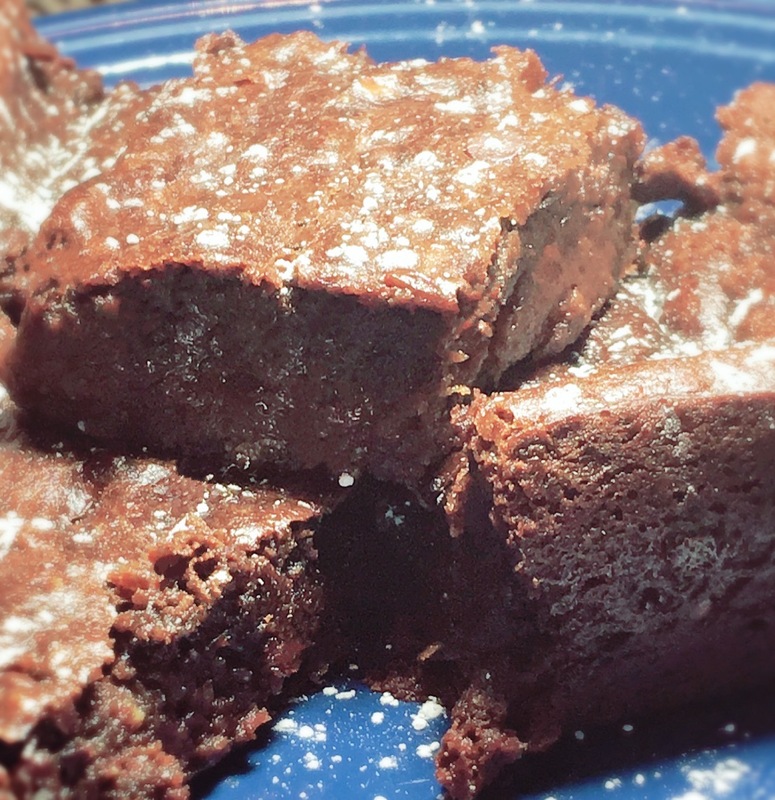 Turns out there are many, many Paleo brownie recipes out there in Internet land! My recipe that follows is sort of a mash-up of several I found including this one from Civilized Caveman Cooking and this similar version from Paleo Grubs. The common ingredients are almond butter and cocoa powder (obv. ), either honey or maple syrup, an egg or eggs, vanilla and leavening agents. Because I find plain brownies to be a bit boring, I decided to mix it up a little and use 2 types of nut/seed butters. Instead of using almond butter alone, I decided to try combining 2 butters as the brownie base. 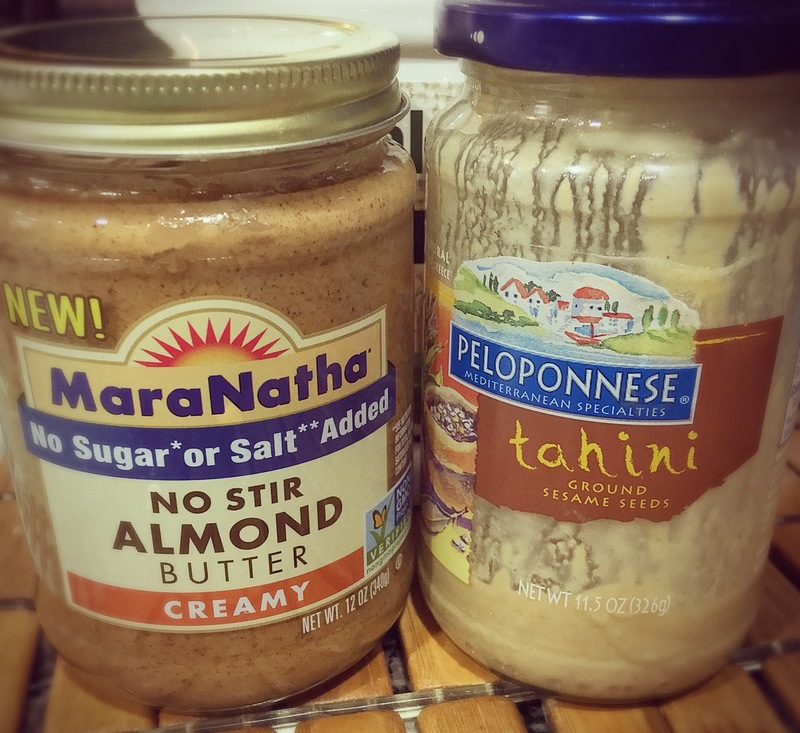 I’m always looking for ways to incorporate tahini into my recipes because #1 it tastes yummy (and is a great dupe for peanut butter which I still kinda miss). #2 It’s a single-ingredient food – containing nothing but sesame seeds. I’m a big believer in reading labels and ingredients lists. My stance is, the shorter the ingredient list, the better. And #3, sesame seeds have some really healthful nutrients like copper, magnesium and a surprising amount of calcium. I’ve been reading lots of articles (like this one and this one) lately urging me to eat more tahini and figured this was a great opportunity. I also elected not to melt the chocolate chips but rather to just stir a few into the mixture prior to baking. The resulting brownies have a nice textural balance somewhere between cakey and fudgey (denser and fudgier if veganized). And I’m relieved to report that you can’t really taste the banana at all (I was worried about that). 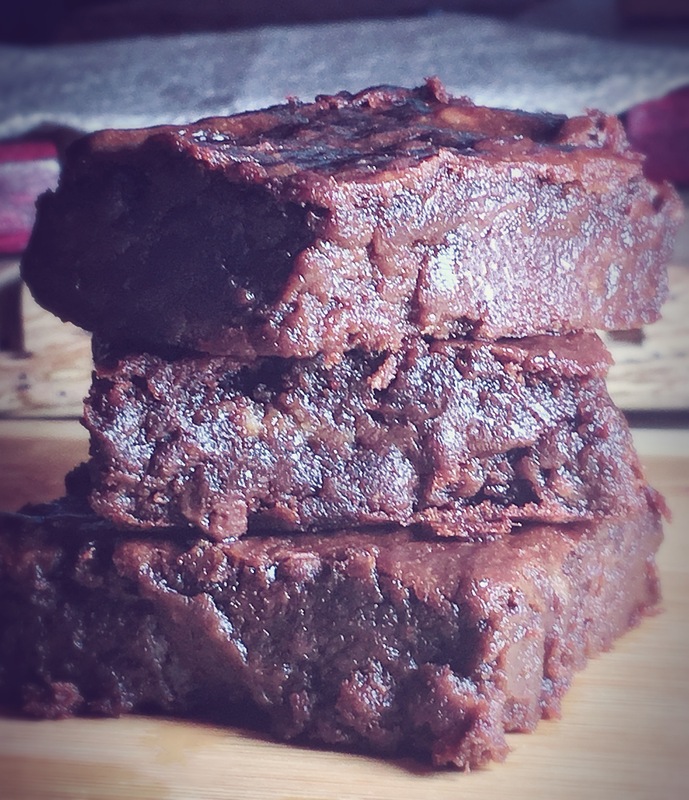 Daily Beauty Wisdom Vegan+Paleo Brownies Fudgy Chocolatey Awesomeness! 1. Preheat oven to 340° (Fahrenheit, or 171° Celsius), and spray 9 X 13″ baking pan/dish with nonstick spray and set aside. Alternatively, you could oil the inside of the pan using a paper towel (coconut oil works best for this). 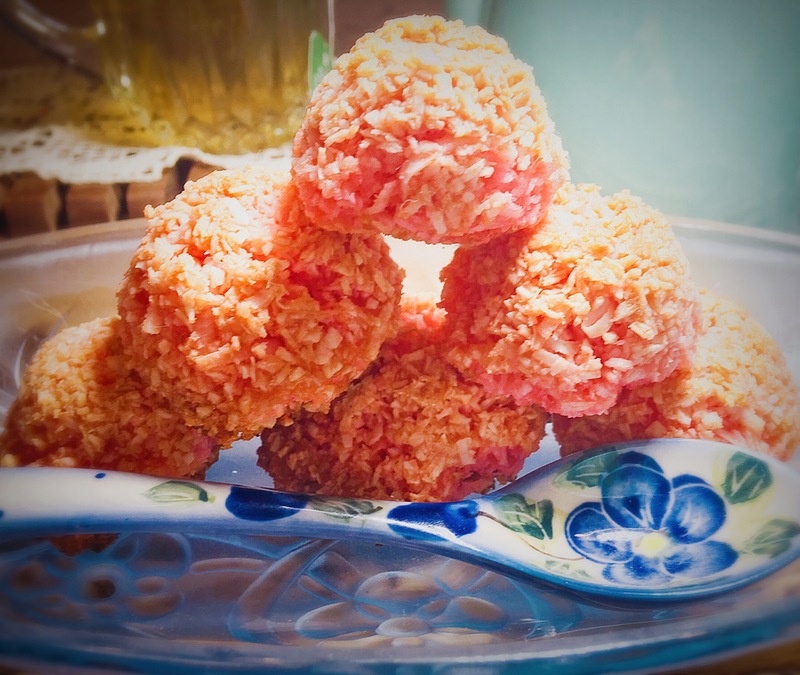 If using egg substitute, prepare now and place in refrigerator until ready to use. 2. In a large mixing bowl, combine nut butters, vanilla and mashed banana. Stir until well-combined and mostly smooth. There will still be some lumps, and that’s okay. I used a sturdy fork to combine this part of the ingredients. 3. Fold in honey or syrup and beaten eggs (or egg substitute) and stir to combine. 4. In separate smaller mixing bowl, sift together cocoa powder, salt and baking soda until thoroughly blended with no lumps remaining. 5. 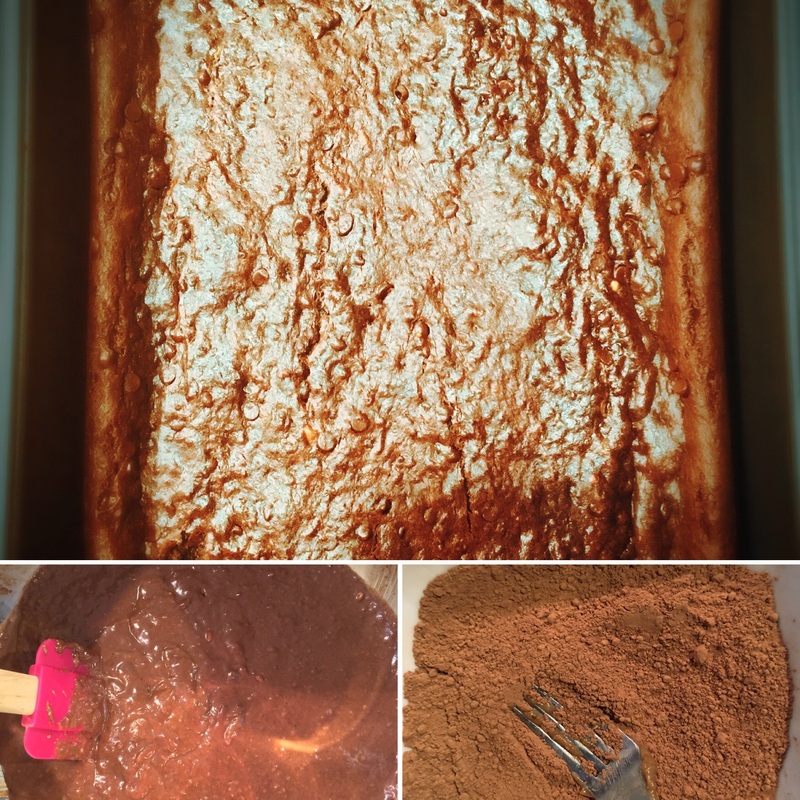 Using a spatula, GENTLY fold cocoa mixture into wet ingredients, stirring just until combined. 6. Next using an electric hand mixer or stand mixer set on low, blend ingredients together for about 3 minutes, pausing occasionally to scrape down sides of the bowl using the spatula. 7. Transfer mixture to prepared baking pan/dish, and spread mixture out evenly in the dish or pan. Then place in preheated oven. 8. Bake for 35-40 minutes if you used eggs and for 40-45 if you used an egg substitute. I recommend testing for doneness using a toothpick or thin knife after shortest baking time (i.e., 35 min for egg recipe and 40 min for veganized recipe). Allow to cool thoroughly before cutting. • My beef with brownies is that I find them to be too plain (versus cake which has icing/frosting and cookies which tend to have nuts and chips and other goodies mixed in). 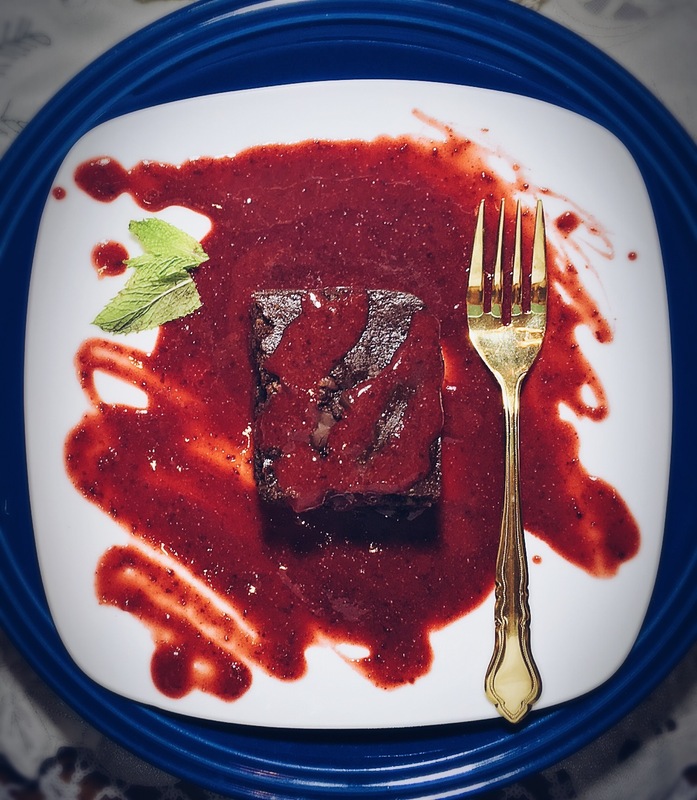 So I prefer serving these brownies with a sauce of some kind. 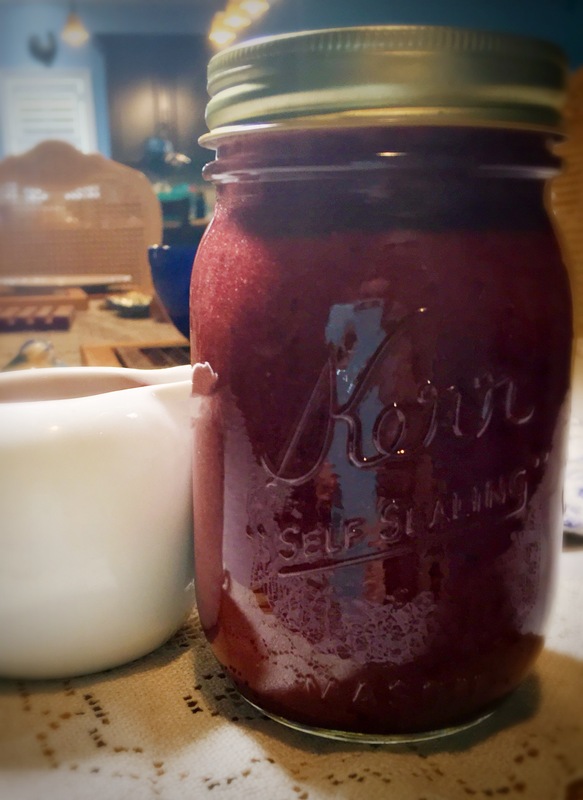 And for that, I highly recommend this quick and delicious Stupid Easy Paleo Cran-cherry sauce (available here). It also makes for a much prettier (and more impressive) presentation when plated. • This recipe could easily be #vegan-zed by substituting ground flax or chia seeds for the 3 eggs as follows: Grind about 3 Tbsp. 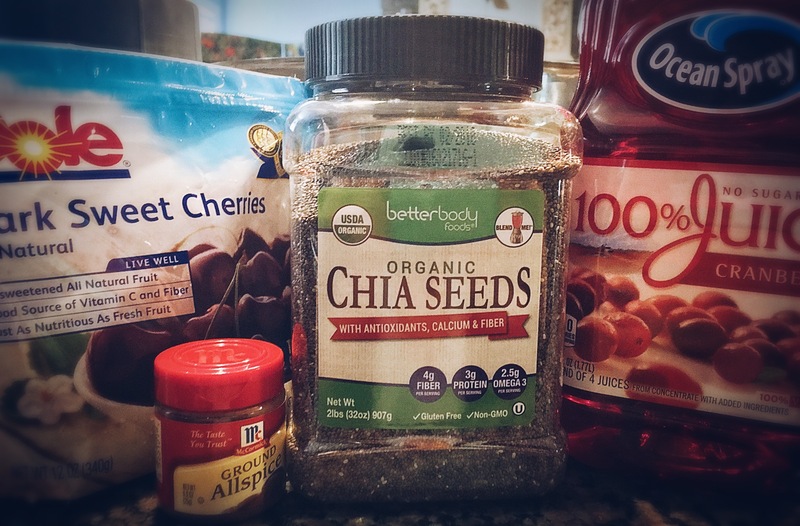 flax or chia seeds to produce 3 Tbsp. meal (you may end up with some extra meal left over). Then combine 3 Tbsp. 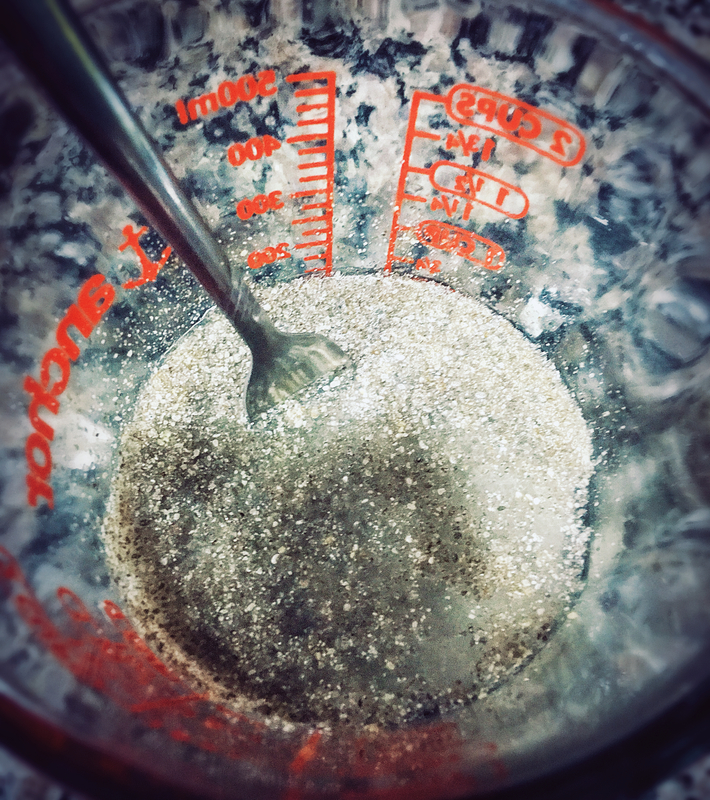 ground flax or chia seed meal + 9 Tbsp. water. Allow mixture to sit (preferably in the refrigerator) for about 15 minutes before using in recipe. Click to read more here. Combine 3 Tbsp. 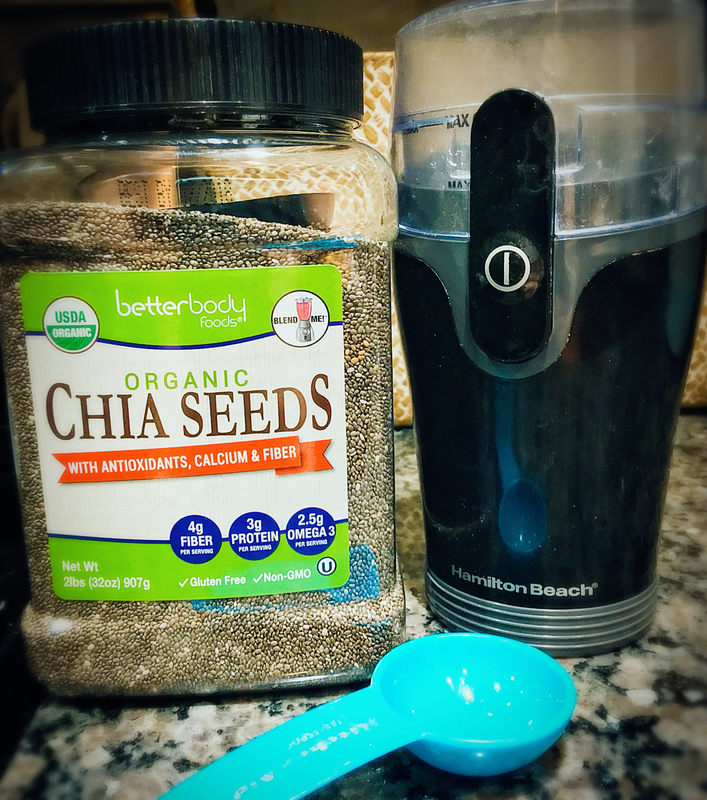 Ground Chia or Flax Seeds with 9 Tbsp. Water. You could also use one of the egg replacement mixes available. Bob’s Red Mill makes one as does Ener-G but there are several others. I veganized the 2nd batch I baked of these brownies (using chia seed meal + water for egg substitute). I found the vegnized brownies were denser and fudgier than the brownies made with eggs (which were more cake-like in consistency). I actually preferred the veganized version. But take note, the veganized version did require extra baking time and may have a different texture. “My children, eat honey, for it is good, and the drippings of the honeycomb are sweet to your taste. Know that wisdom is such to your soul; if you find it, there will be a future, and your hope will not be cut off.” ~Proverbs 24:13-14 (English Standard Version) Read more here. 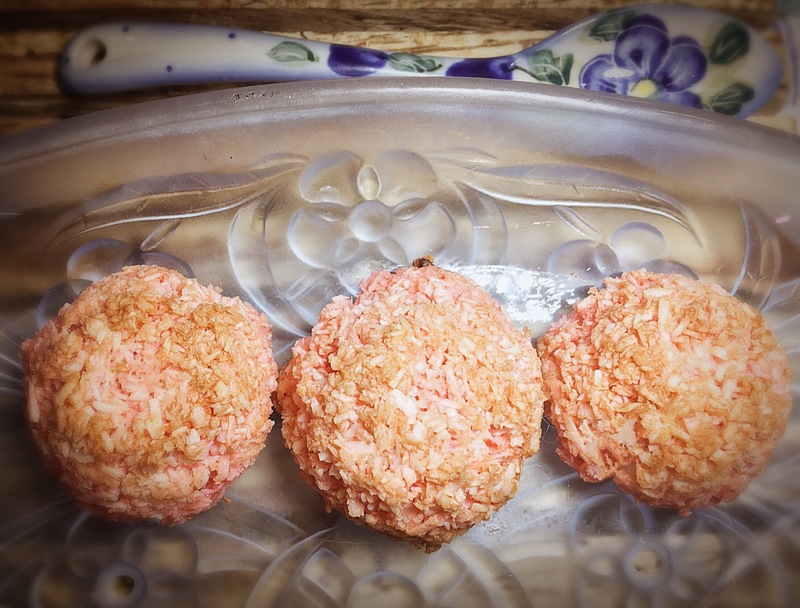 This entry was posted in Appetizers & Snacks, Desserts, Gluten-free Recipes, Pretty Food and tagged #cleaneating, #dairyfree, #glutenfree, #grainfree, #justeatingrealfood, #justeatrealfood, #momlife, #PALEO, vegan. Is it hot where you live? 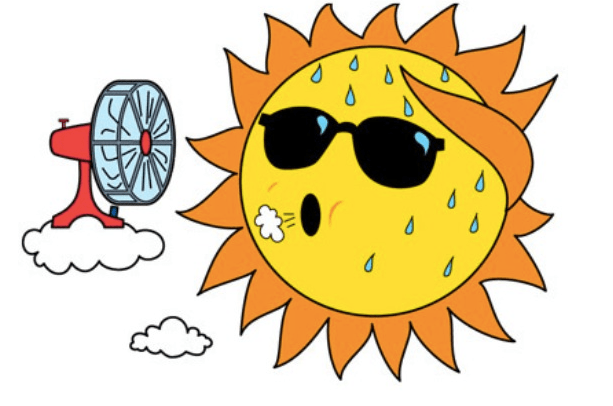 Because it’s REALLY hot and humid where we are! I didn’t really need another reason to serve salads every night with dinner. But, these long, summer days seem to make my family more willing to eat fresh crunchy greens and lettuce every night as long as they have a continuous supply of new and exciting (read homemade) dressings to jazz up said salads. This has presented me with something of a challenge because I’m still relatively new to dressing-making (if that’s a thing). And whenever I’m working on a new dressing, I always worry that I may experience a repeat of my great mayonnaise fiasco from our first #WHOLE30 journey in April. 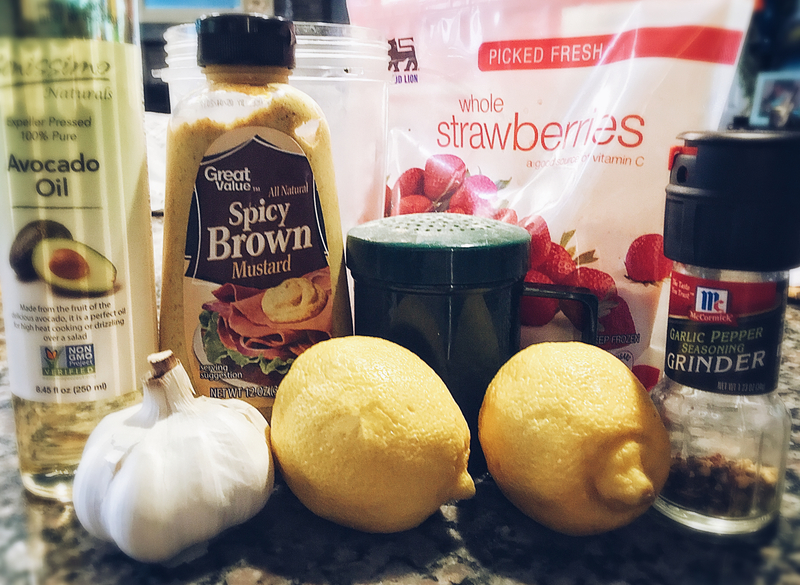 Fortunately, I’ve learned some reliable salad dressing-making tricks since then and have discovered some tasty salad topping recipes along the way (including Presto Peachy Lime Vinaigrette, the Split Second Strawberry Vinaigrette and Paleo Lemon Garlic Vinaigrette). 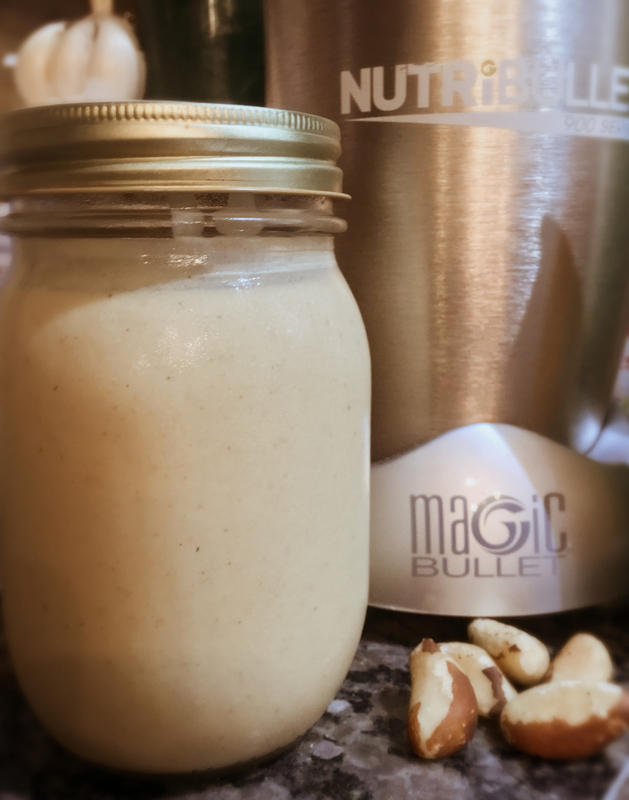 My current favorite method for whipping up a quick and easy, thick and creamy dressing using healthy ingredients is to employ our trusty NutriBullet 900. I’ve discovered it’s practically foolproof. 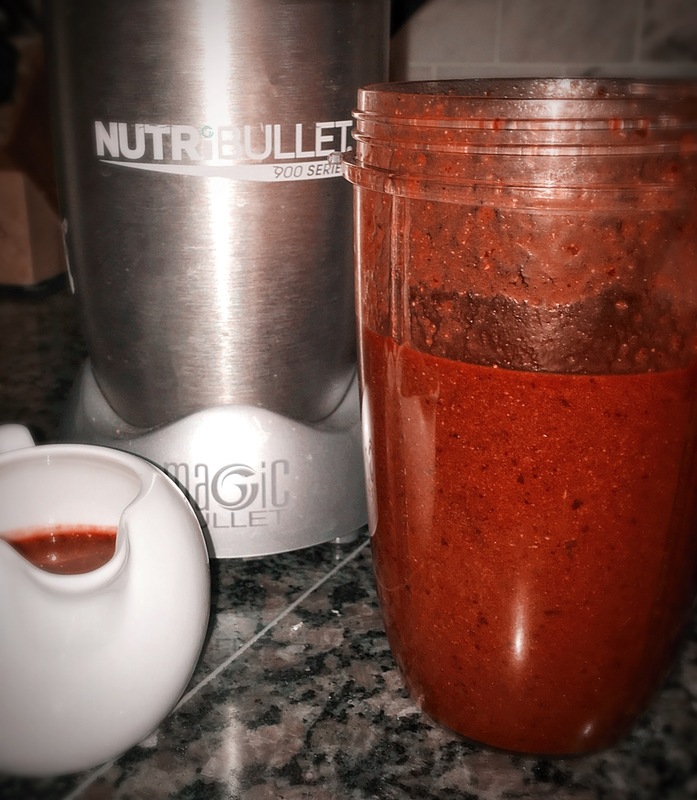 And I’d highly recommend investing in a NutriBullet or other high-powered blender (e.g. Vitamix) if you’re looking to transition from processed foods to making the majority your own foods (especially dressings and sauces) from scratch. Lately, we’ve been including a series of different fresh fruits in our nightly salads – everything from sweet seedless grapes to juicy local peaches to tangy pineapple and succulent papaya. The sweet juicy fruits and crisp greens seem to beckon for a saltier more robust dressing, something with garlic, citrus, and ginger; something interesting, with a kick. We haven’t consumed any soy products since completing #WHOLE30, but I still find myself craving something akin to a sweet teriyaki but creamier. 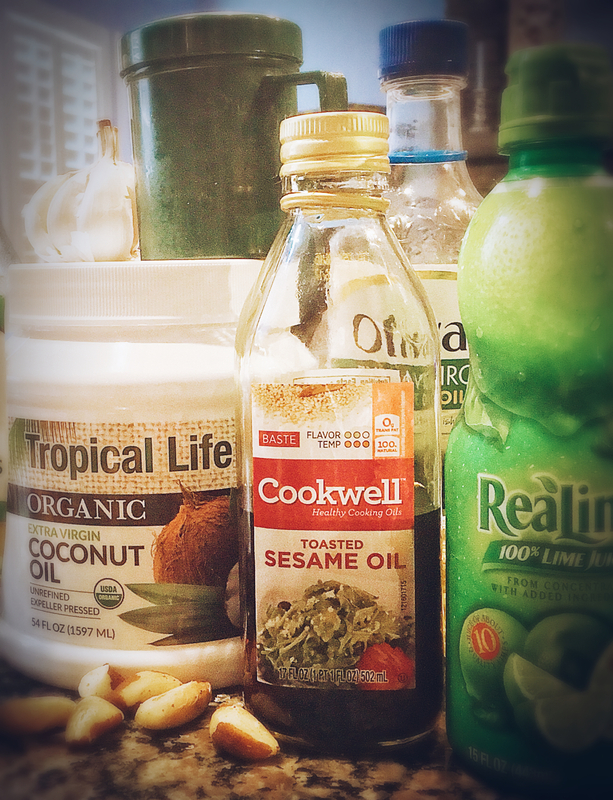 Thank goodness for Coconut Aminos Sauce – the answer to my salty soy cravings! Not only is this dressing soy-free, it also has a hefty dose of selenium thanks to the inclusion of Brazil nuts. 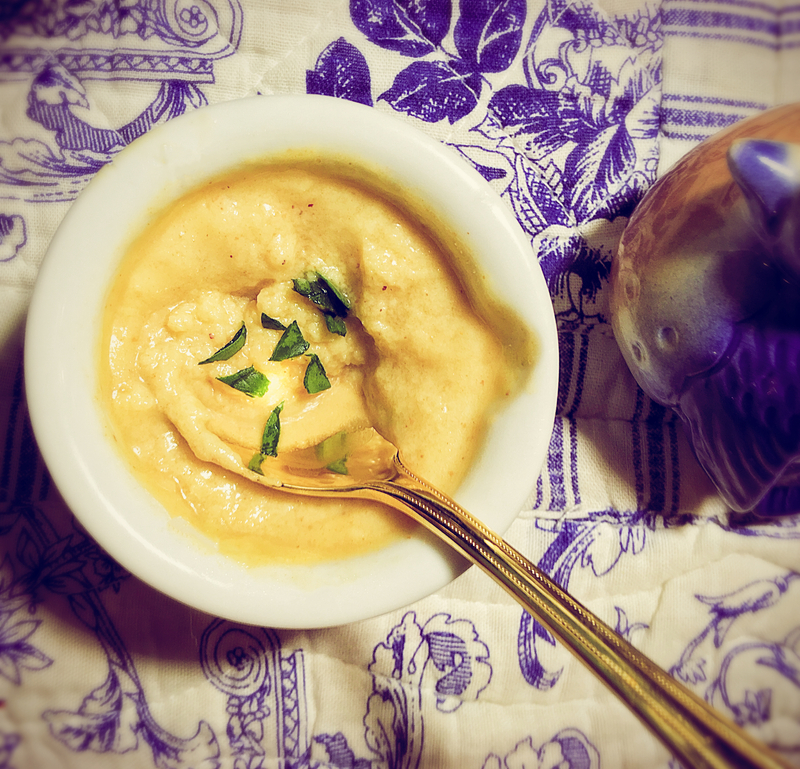 The garlic and fresh ginger provide anti-inflammatory protection, and the citrus juices offer a nice hit of Vitamin C. Did I mention that the oils contribute antioxidant protection in the form of Vitamin E? It’s true. Those same extra virgin oils contain useful fatty acids that will help your body better assimilate all the valuable nutrients in the salad. 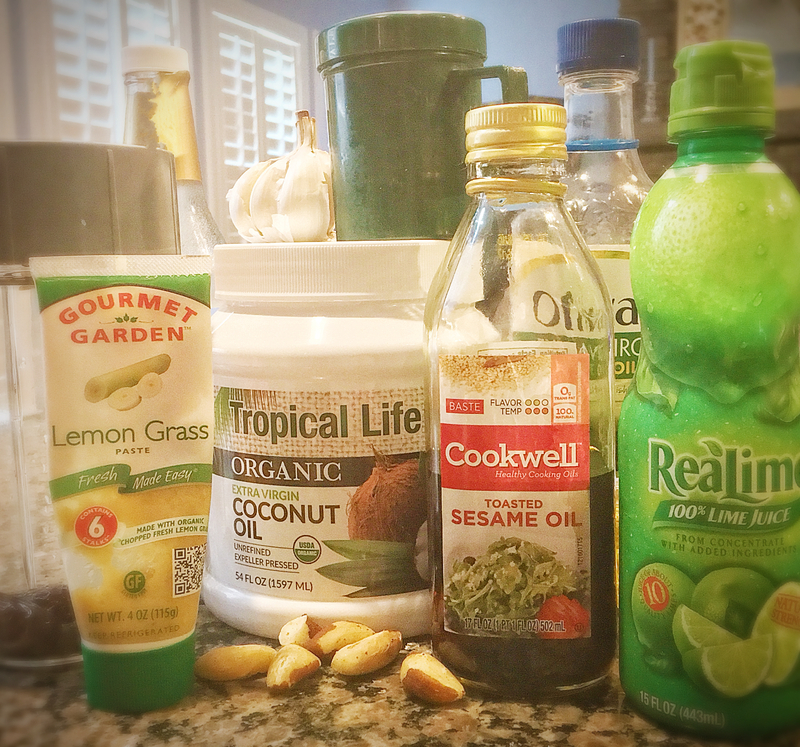 This dressing is a health fest! It’s about 85-95% raw (depending on the oils you use). It’s vegan; suitable for those following a #paleo lifestyle; and is #whole30-compliant as well (provided you following the instructions in the comments below and always read ingredients and food labels). 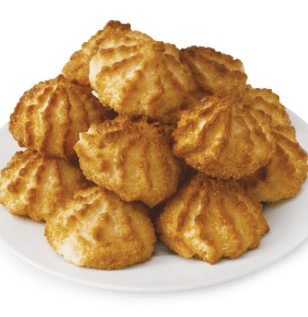 Most importantly, it’s yummy, and your family will love it! N.B. this recipe makes about 2 cups (scant) of dressing and will become thicker as it sits in the fridge (due to the coconut oil). You will find that it becomes thin and spreadable again as soon as you spoon it out onto a salad. It pairs well with avocado or guacamole, fruits and nuts, Asian or Southwestern spices and a sprinkle of fresh herbs as shown here. Assemble your ingredients in advance for super-speedy salad dressing-making success! 1. After soaking, drain dates and discard soaking liquid. visible chunks or pieces of ingredients are visible. 3. Remove lid and test for seasonings. Adjust to your taste preferences. If you do adjust the seasonings, replace lid and blend on HIGH for a few seconds more. 4. Pour dressing into a jar or bottle. Cover with lid and store in refrigerator until ready to use. Garnish with cilantro if desired. Dressing will keep for about 1 week in the refrigerator. +++When doing #WHOLE30, it’s very important you get into the habit of checking the ingredient lists of any foods you plan to eat, cook with or serve your family. For example, many brands of dried fruits (including some dates) are processed with sulfites which are not permitted for consumption during #WHOLE30, so be sure to check the dates before you purchase/use them. Also, most Dijon mustards contain white wine which is also not approved for consumption during WHOLE30, which is why you’ll want to use spicy mustard instead. For a complete list of #WHOLE30 program do’s and don’ts as well as answers to just about any #WHOLE30 questions you may have, I highly recommend you check out the program rules here and other resources available at WHOLE30’s website to educate yourself prior to beginning your own #WHOLE30 journey or whenever you have questions or need some support. 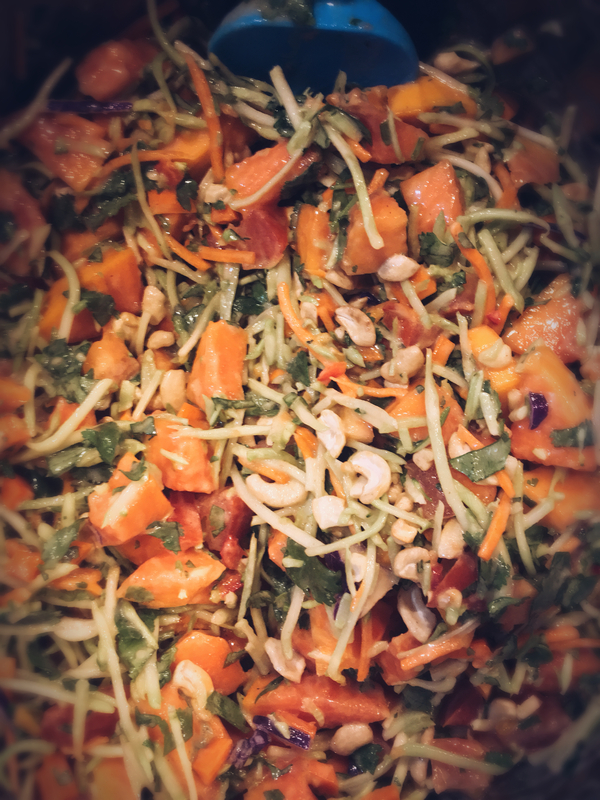 BTW – If you’re looking for a salad recipe to go along with this dressing, I highly recommend using this Quick & Easy Beautifying Papaya Salad recipe. It’s healthy, delicious, and is easily adapted for vegans, paleo and #whole30-ers. And it’s chalked full of good-for-you nutrients! ~Daniel 1:11-17 (Common English Bible) Read more here. Ever feel completely clueless when it comes to applying eyeshadow? You’re not alone. Sometimes I still look at those big beautiful (often expensive) shadow palettes that are so popular these days and feel…totally overwhelmed, like I wouldn’t even know what to do with all those color options. Luckily, great-looking eyeshadow doesn’t have to be that complicated and needn’t involve more than 2 colors! Emily Noel is here to tell us all about the “sandwich method” in this super-quick, super-informative video – complete with step-by-step tutorial, suggested shadow duos (both top-shelf and drugstore options) and listings + links for all products & tools used or mentioned in the video. The always delightful Ms. Emily really shines in this gem of a beauty Vlog! 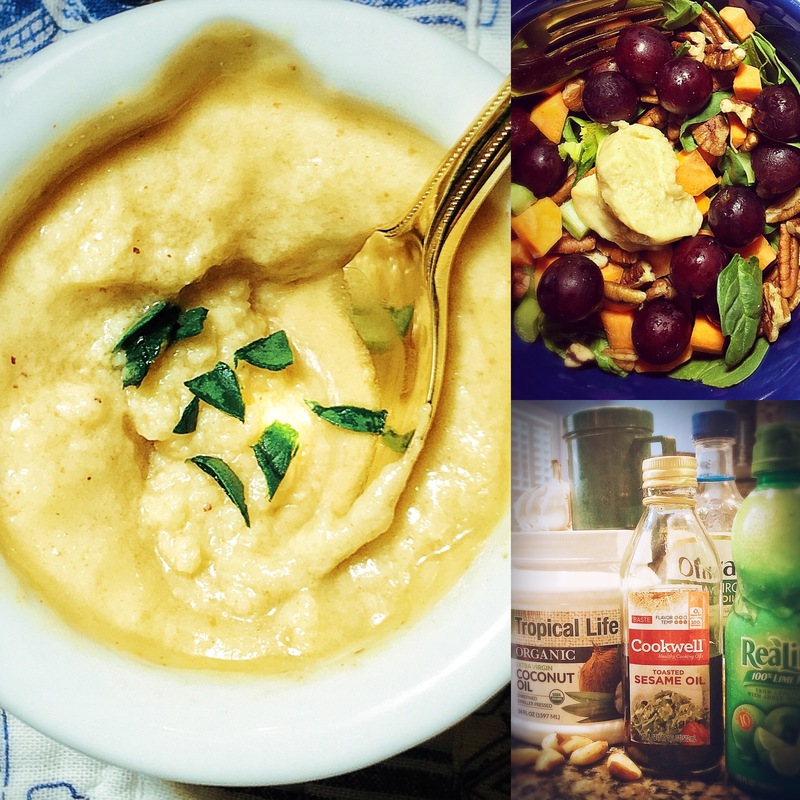 This entry was posted in Beautiful Basics, Food & Nutrients for Beauty, Gluten-free Recipes, Pretty Food, Salads & Dressings, Side Dishes, Vegan Recipes, Whole30 and tagged #AIP, #justeatrealfood, #momlife, #PALEO, #raw, #salad, #WHOLE30, vegan. 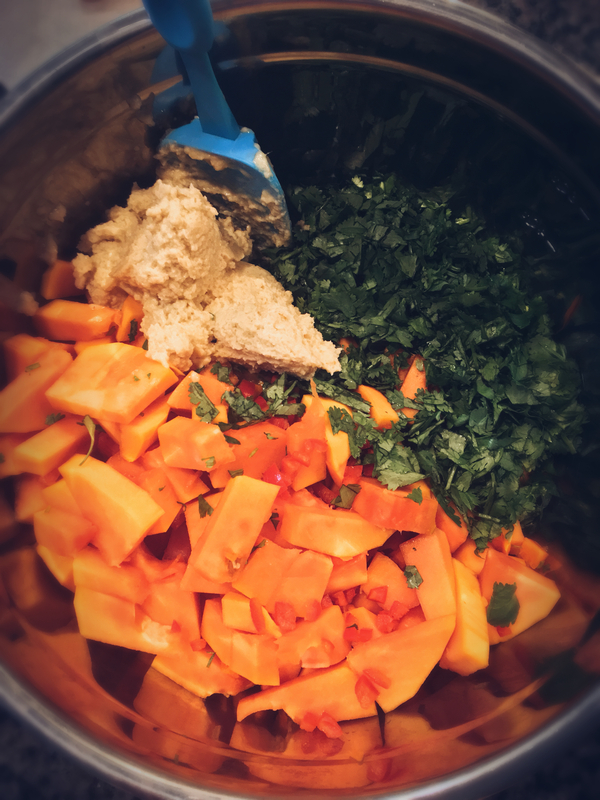 If you’ve followed this blog for a while or have read any recipes for beautiful skin and hair series, then you already know I’m really into cooking for beauty. Don’t get me wrong. I’m into external beauty products too. I desperately love cosmetics, makeup, hair products and beauty treatments of all kinds. My bathroom is literally overflowing with lotions and potions of all shapes, sizes and price points! But as the saying goes, beauty begins on the inside. And no amount of making up can disguise unhealthy insides. That’s especially true as we age. And I’ve found that after pregnancy, my body is far more likely to display outwardly any signs of dis-ease I may be experiencing inwardly. And since our baby girl has recently become independently mobile (translation lots more work for Mommy and Daddy to keep up with her), it’s definitely in my best interest to eat as healthfully as possible. So, I’ve been writing a series of recipes based on HealthGrove’s recent study identifying the top 30 foods for beautiful skin and hair (If you’ve missed any of the previous recipes from the series, do not despair. I’ve listed each of them below). Fortunately for folks like me, the Internet offers tons of (mostly consistent) advice for those of us seeking the best foods to eat for health and beauty (including of course that recent HealthGrove study). 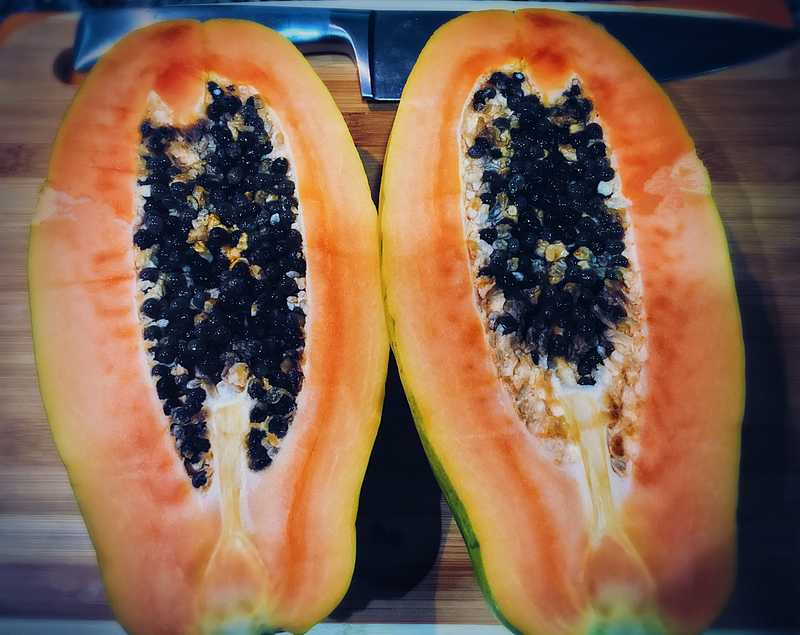 Today’s recipe includes a veritable stockpile of beautifying ingredients including most notably #5 of HealthGrove’s list – PAPAYA. 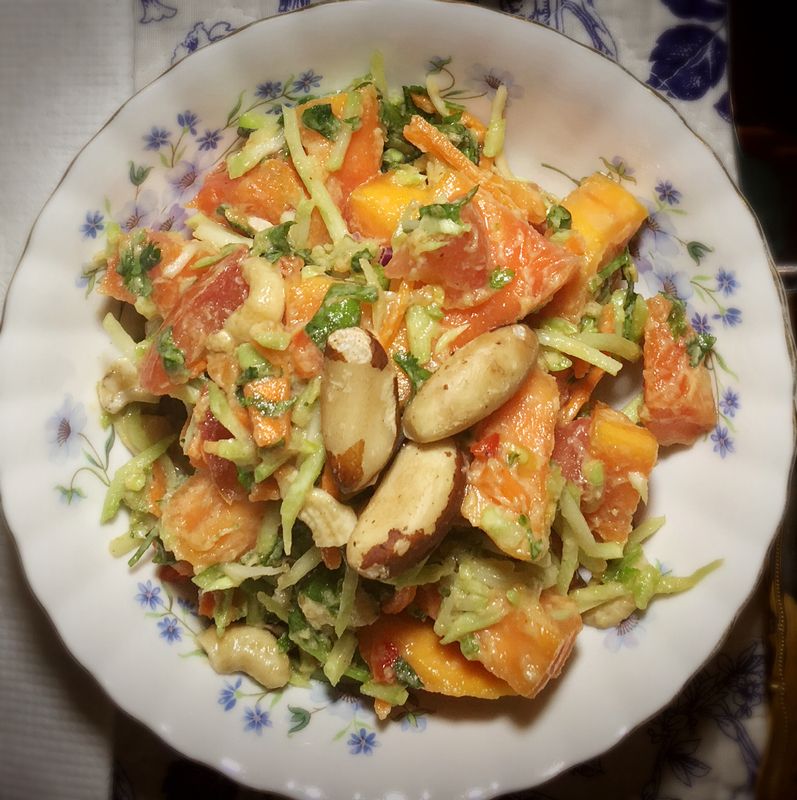 Vitamin C – provided by the papaya, tomato and broccoli slaw. 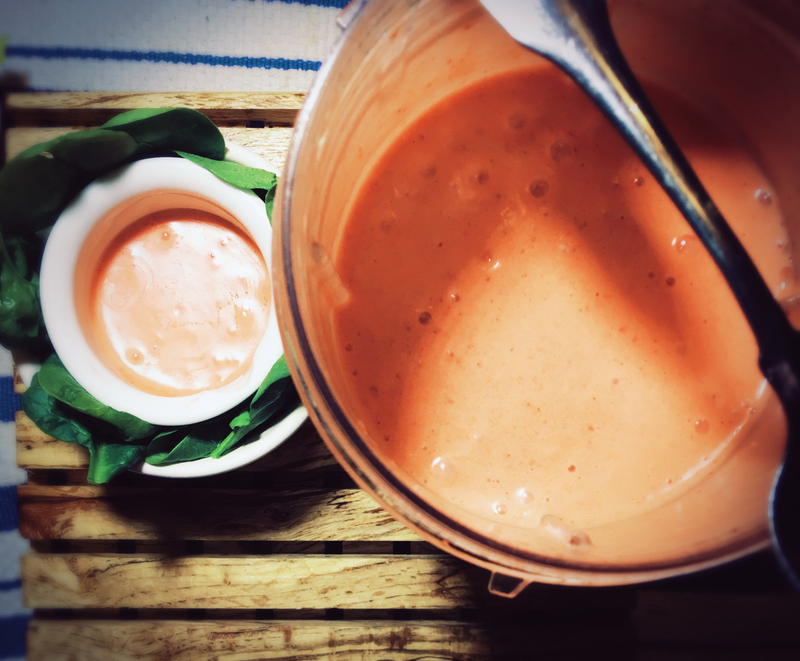 For more on the beautifying antioxidant benefits of Vitamin C, check out this article and recipe for #whole30 compliant #paleo and #vegan (and super-yummy) Strawberry Vinaigrette. Broccoli slaw is not only an antioxidant fest. It’s also quick and ready in an instant! 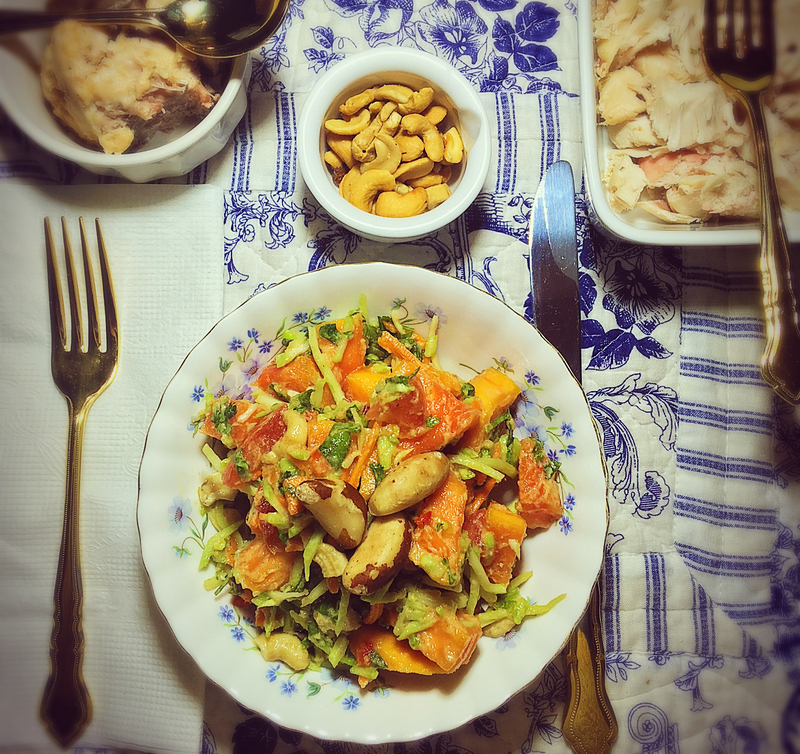 Selenium – provided by the Brazil nuts in the dressing. Did you know that Brazil nuts are in fact the #1 food source of selenium? Lycopene (bonus nutrient) – lycopene has been shown in recent studies to protect skin against sun-related aging and sun damage. 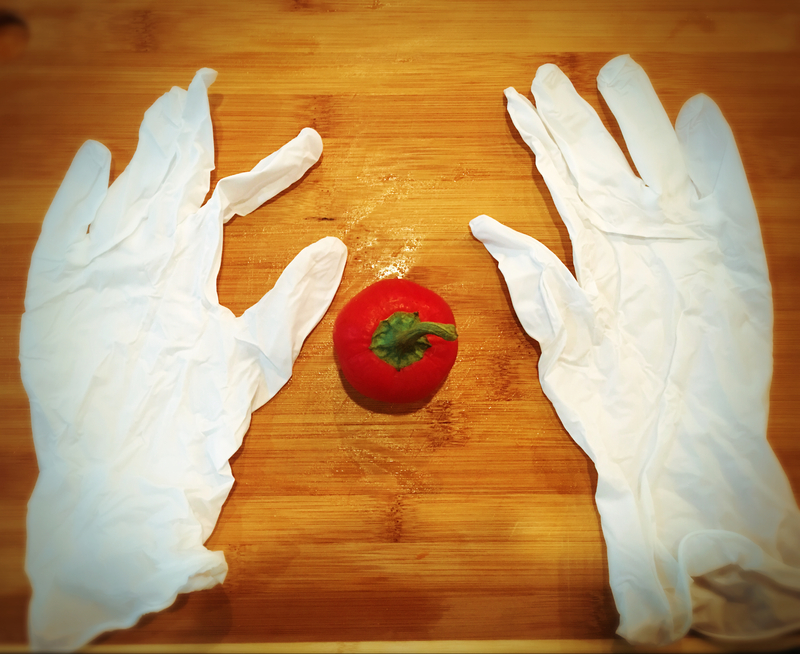 This recipe provides lycopene from 2 sources – EVOO and fresh tomato. Plus, this recipe is easily adjusted to suit vegans, vegetarians, paleo-types and folks actively doing #whole30. It’s quick and easy to prepare and (perhaps) most importantly, it tastes really good. Whoop! Whoop! +++When doing #WHOLE30, it’s very important you get into the habit of checking the ingredient lists of any foods you plan to eat or use when cooking. Many dried fruits (including certain brands of dates) are processed with sulfites which are also not permitted for consumption during #WHOLE30, so be sure to check the dates before you purchase/use them. Also, most Dijon mustards contain white wine which is also not approved for consumption during WHOLE30, which is why you’ll want to use spicy mustard instead. For a complete list of #WHOLE30 program do’s and don’ts as well as answers to just about any #WHOLE30 questions you may have, I highly recommend you check out the program rules here and other resources available at WHOLE30’s website to educate yourself prior to beginning your own #WHOLE30 journey or whenever you have questions or need some support. 1. Prepare dressing as follows: Drain dates and discard soaking liquid. Place dates, 2 Tbsp. Coconut Aminos (reserving 2 Tbsp. for later use) and all other dressing ingredients into canister of blender. Place lid on blender and process on HIGH until dressing is very smooth and no visible chunks or pieces of ingredients are visible. Remove lid and test for seasonings. Adjust to taste. (I found that dressing was appropriately seasoned without adjustments but add salt or additional spices to your preferences.) Then pour dressing into a jar or bottle. Cover with lid and store in refrigerator until ready to use. Note, this recipe makes about 2 cups (scant) of dressing and may be made up to 3 days in advance. It will keep for about 1 week in the refrigerator. 2. Wash and dry all vegetables, including cilantro. If you have a salad spinner, place washed cilantro in spinner and spin until dry. If you don’t have (or don’t wanna use) a salad spinner, simply placed washed cilantro on a clean kitchen towel and pat dry. 3. Using vegetable peeler, peel carrots and papaya. N.B. Trust me on this one! 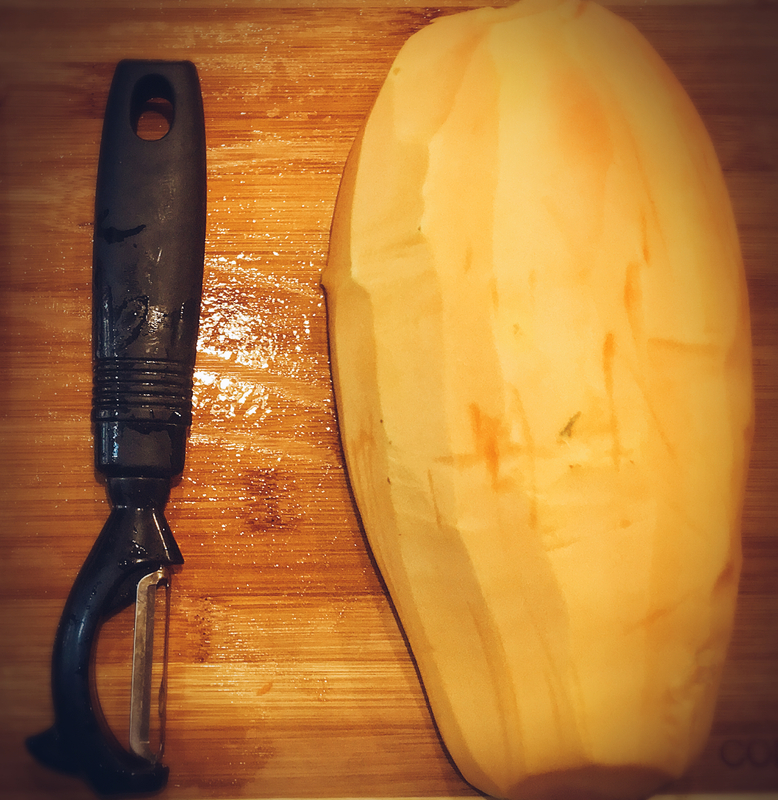 I tried cutting half the papaya without peeling it first (I figured I’d cut it like an avocado, scoring it and removing the peel afterwards). No dice! It was a disaster trying to get the peel off, and I nearly removed my fingertips along with the peel! With the 2nd half I got smart and peeled it first. What a difference. I finished chopping it in half the time and with no near-death experiences. 4. Finely chop the washed and dried cilantro. Then transfer it to mixing bowl. Next chop the papaya and all the vegetables (except pepper) into roughly equal bite-sized chunks and place into mixing bowl. 5. Put on gloves. Cut pepper in half and remove all seeds, stem and membranes. Then chop pepper into very small pieces. 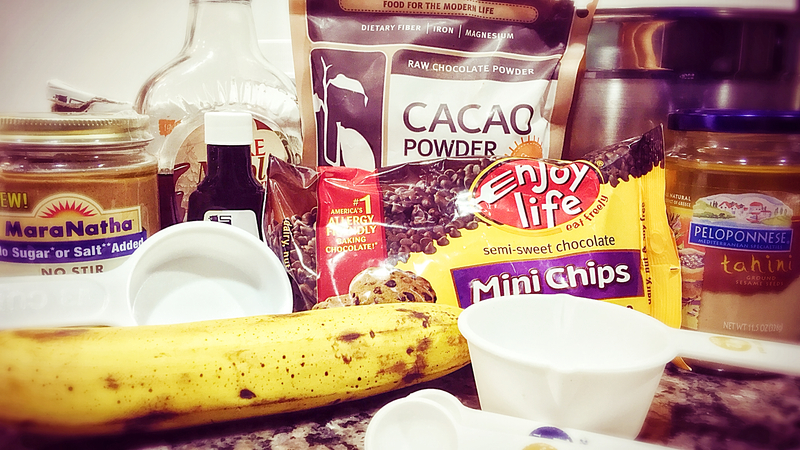 Place in mixing bowl with other ingredients. Carefully remove gloves and immediately wash your hands. Try not to touch your face or anyone else before taking off, disposing of gloves and washing your hands. Also I used a separate cutting board just for the pepper and washed the cutting board and knife before removing the gloves. 6. 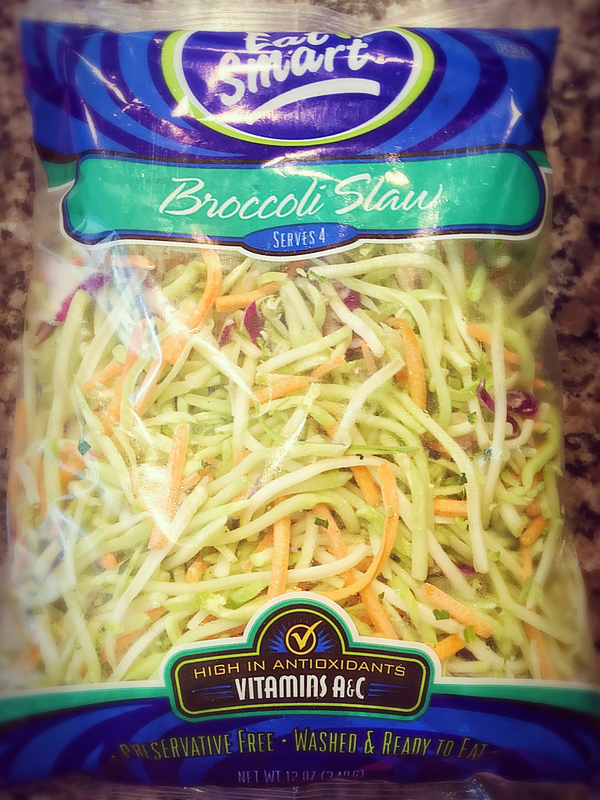 Open bag of broccoli slaw and dump into mixing bowl along with other ingredients excepts nuts, dressing and remaining 2 Tbsp. Coconut Aminos. Then add dressing and stir well to combine. If everyone in your household wants the same protein option, then feel free to stir it in at this point. Otherwise, wait and serve several protein options along side Refrigerate at least 2 hours before serving. 7. Just before serving, stir in remaining 2 Tbsp. Coconut Aminos and nuts. 8. Serve with multiple protein options (unless you already stirred proteins into salad). Example in our house both my mother and my Hubs selected shredded leftover rotisserie chicken. But I selected salmon as my protein of choice for some extra Omega-3 fatty acids. Additional garnishes include chopped avocado or Wholly Guacamole, bean sprouts and sunflower sprouts. Enjoy! Put on then, as God’s chosen ones, holy and beloved, compassionate hearts, kindness, humility, meekness, and patience, bearing with one another and, if one has a complaint against another, forgiving each other; as the Lord has forgiven you, so you also must forgive. Read more here. I encourage you to spend a few moments each morning imagining yourself putting on love and compassion, like you’re applying makeup or sunscreen. Surely we need to apply God’s love and compassion daily as the most important and effective beauty treatment! Want more info on what to eat for anti-aging benefits? 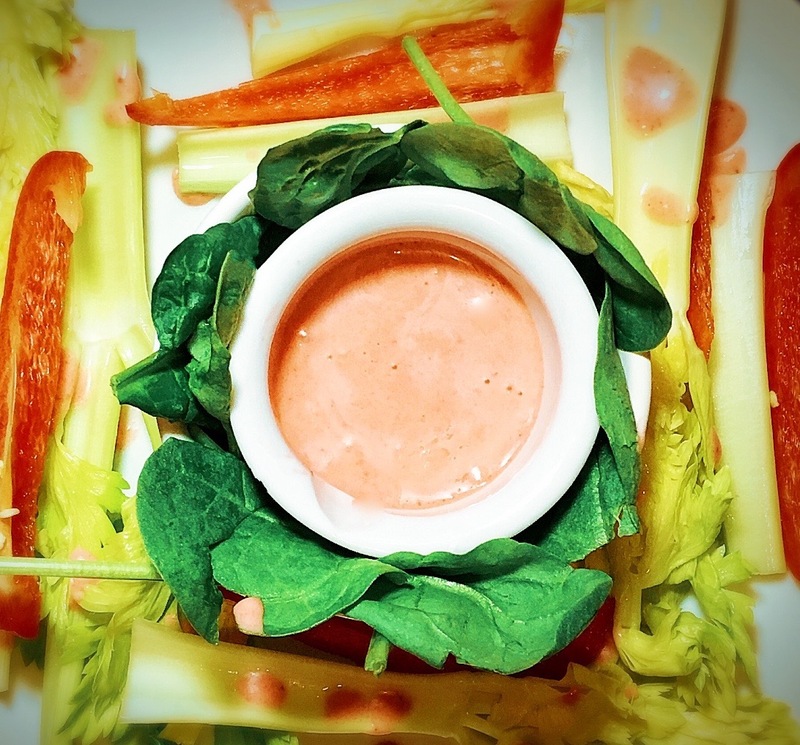 Check out this slideshow from the folks at Total Beauty (Hint: if you consume this dressing on a regular you can cross slide #7 off your to-eat list). This entry was posted in Appetizers & Snacks, Educate Yourself, Entrees & Main Dishes, Food & Nutrients for Beauty, Gluten-free Recipes, Pretty Food, Salads & Dressings, Side Dishes, Vegan Recipes, Whole30 and tagged #glutenfree, #justeatingrealfood, #justeatrealfood, #momlife, #PALEO, #vegetarian, #WHOLE30, vegan. Today’s post is part 6 in my series of recipes based on a recent HealthGrove study identifying the top 30 foods for beautiful skin and hair. 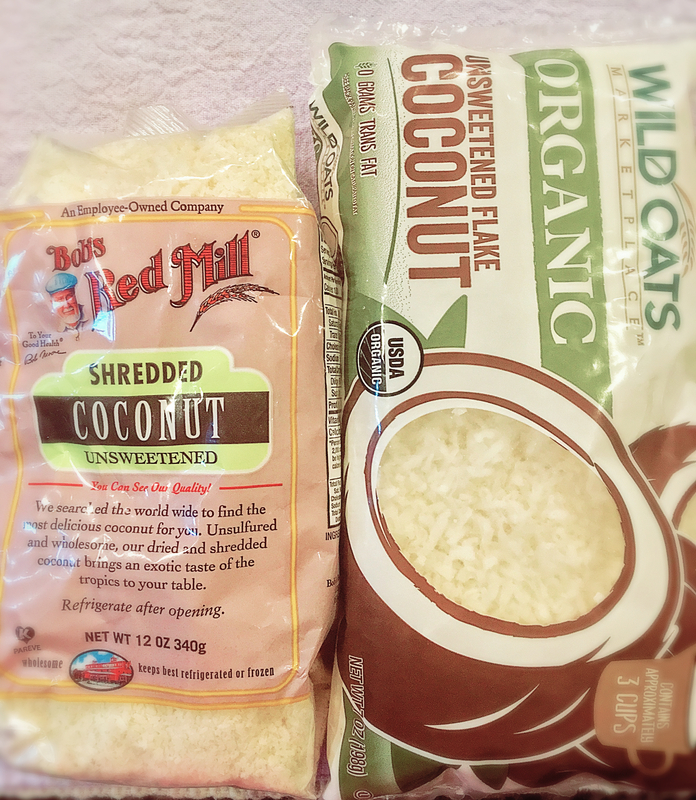 As I have previously discussed, all but 3 of the most beautifying foods are #WHOLE30 foods. The 3 exceptions on the list (those foods not technically Paleo or WHOLE30-compliant) are legumes (i.e. beans), not dairy or grains. In case you missed any of the previous recipes from this series, you will find links for each at the bottom of this post. So, be sure to check those out, and definitely stay tuned to Daily Beauty Wisdom because I’ll be posting all new recipes for each of the remaining #Paleo / #WHOLE30 ingredients from the HealthGrove list (I think I’ve got about 20 or 21 left to cover). And be sure to subscribe to Daily Beauty Wisdom to automatically receive new posts sent directly to your inbox of choice! Today’s beautifying ingredient is the sweet and juicy, bright red succulent strawberry (food #17 from the HealthGrove list). Here’s a little bit of trivia. Did you know strawberries are the only fruit with seeds on the outside? Strawberries are low calorie, high in fiber and a terrific source of Vitamin C (necessary in the synthesis of collagen, the key component of healthy skin and hair), providing more than 100% of RDA per serving. Vitamin C is one of several antioxidant vitamins. You may be wondering why antioxidants are important. Antioxidants protect the skin (and other cells) from oxidation which occurs when our bodies are exposed to free radicals like the sun’s rays, smog, second-hand smoke and other environmental toxins. Oxidation is akin to rusting of the body, and it’s the primary way the body shows its age. Anti-oxidants are the antidote to oxidation, like tiny molecular-level shields protecting against rust and decay inside the body. (when we eat foods high in antioxidants like strawberries) or when applied topically (when using cosmetics that have added antioxidants ingredients). The the science is mixed with respect to usage of antioxidants in preventing disease. But antioxidants are generally accepted as anti-aging superstars. Most experts recommend getting our antioxidants from foods (versus supplements) and suggest the best way to combat aging is to eat foods high in antioxidants and other skin-beneficial ingredients (like biotin and good fats); to get lots of sleep (sleep is when the body repairs itself from damage it sustained during the day); and to use products with antioxidants and other skin-beneficial ingredients (source here). I whipped up this recipe on Father’s Day to serve to Hubs. Since this was his first official Father’s Day I had quite the special Daddy Dinner menu in the works, including among other things these paleo pancakes (remember we’re not currently doing a #WHOLE30) with homemade strawberry syrup (I used the remaining thawed strawberries, some unsweetened OJ and coconut sugar simmered on LOW for 2 hours); scrambled eggs and bacon; tossed salads and this vinaigrette. 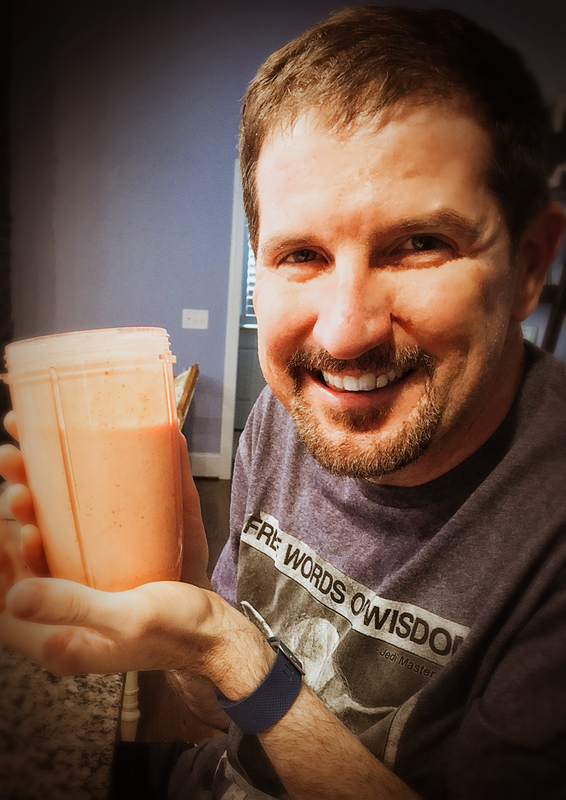 The hallmark of successful recipe – a smiling Hubs! Because I took a couple of preparatory measures in advance (soaking the dates in the fridge overnight and pre-measuring lemon juice + other ingredients in advance), this recipe was quite literally ready in seconds. I timed it. It took around 47 seconds, literally less than 1 minute to prepare. 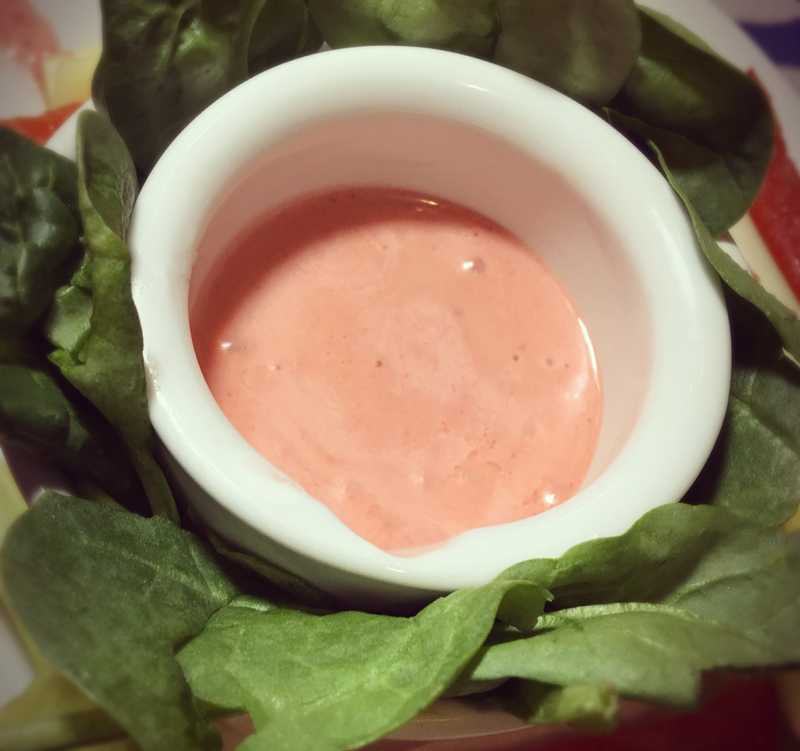 If using frozen strawberries (which I think is the way to go as long you are careful to purchase UNSWEETENED, AKA no sugar added berries), just remove the bag from the freezer (and place in the refrigerator) the night before you plan to make this dressing. I actually soaked the dates in the fridge overnight too, just to save a little prep time on Sunday. 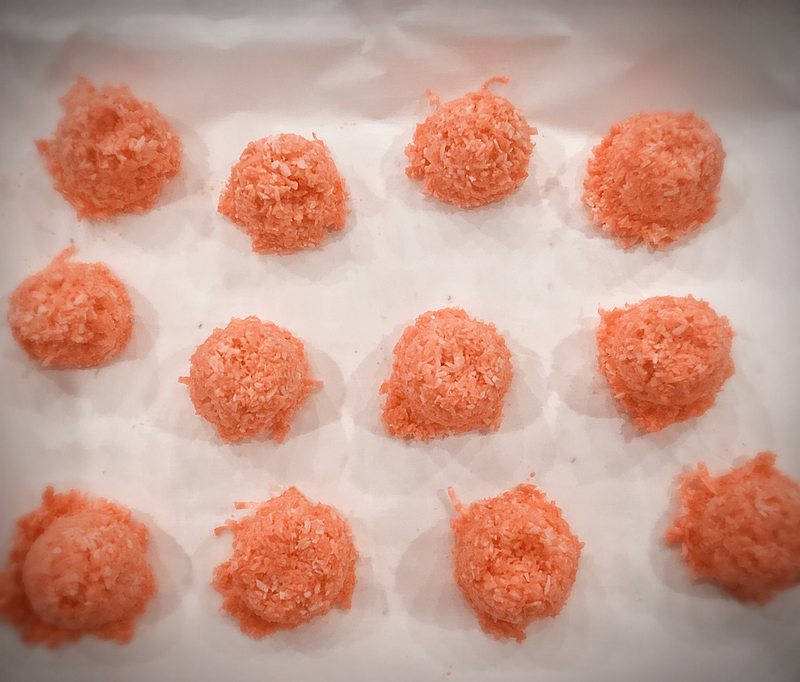 BTW, I used defrosted frozen strawberries in this recipe only because I had them on hand (and I’m a big believer in using what ya’ got). But It’s summertime in North America, at least. So if you can get your hands on some fresh (preferably local) strawberries, I highly recommend using those in this recipe. 1. Drain dates and disgard soaking liquid. 2. Add dates, strawberries and all other ingredients to pitcher or jar of blender. 3. Place blender pitcher on base, cover and blend on HIGH until no chunks or pieces of the fruit or garlic remain. It should take no more than a minute. 4. Remove blender from base and remove lid. Test dressing for seasoning and adjust as needed to taste. Then refrigerate until ready to use. ~Makes about 2 cups vinaigrette. This dressing will keep covered and refrigerated about 1 week. +++When doing #WHOLE30, it’s very important to check the ingredient lists of any foods you plan to eat (actually it’s always important to be aware of what you’re feeding your family, right?). Some frozen fruits contain sugar or other additives not approved for consumption during WHOLE30 (and which aren’t healthy for us to consume anyway). Sugar and sweeteners of all kinds are off limits during #WHOLE30. And, dijon mustard usually contains white wine which is also not permitted during #WHOLE30. Finally, some dried fruits are processed with sulfites which are not permitted for consumption during #WHOLE30, so carefully check the dates you use for this any other recipe. For a complete list of #WHOLE30 program do’s and don’ts as well as answers to just about any #WHOLE30 questions you may have, I highly recommend you check out the program rules here and other resources available at WHOLE30’s website to educate yourself prior to beginning your own #WHOLE30 journey or whenever you have questions or need some support (N.B. 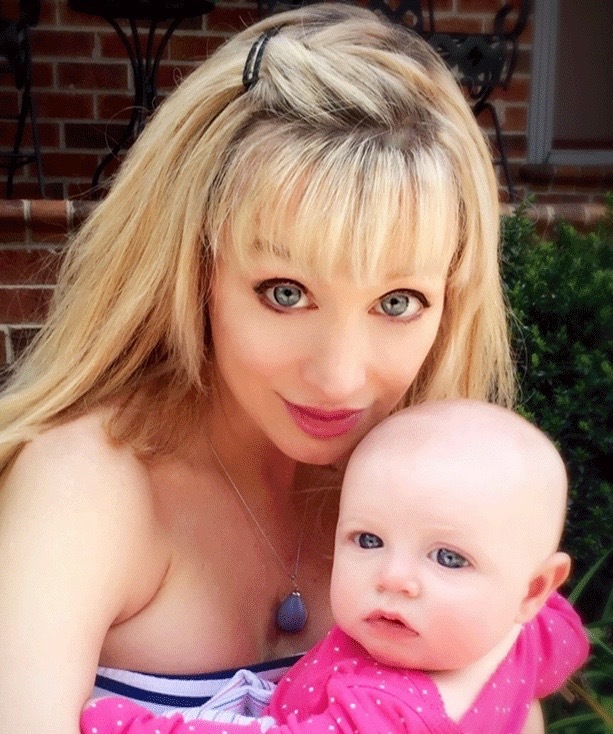 – the Facebook and Twitter feeds are tremendous sources of encouragement and support). Also, consider reading the book It Starts with Food prior to attempting a #WHOLE30. It’s chalked full of useful info and helpful tips to make surviving the whole 30 days a whole lot more tolerable (pun intended). 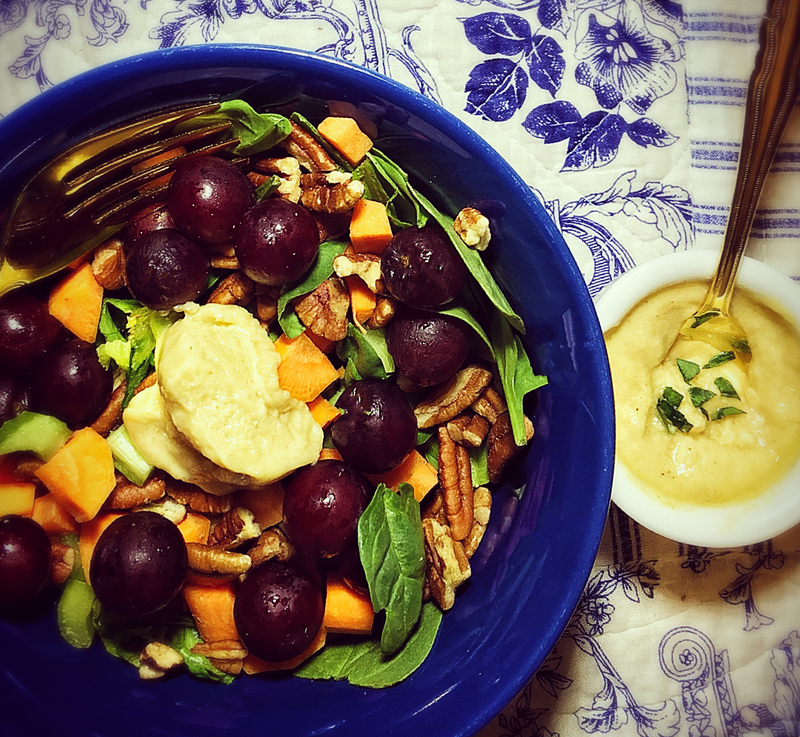 Whip up this simple and super-fast vinaigrette with a quick whirr of the blender! This entry was posted in Beauty Product Reviews, Food & Nutrients for Beauty, Pretty Food, Salads & Dressings, Side Dishes, Vegan Recipes, Whole30 and tagged #justeatingrealfood, #justeatrealfood, #momlife, #PALEO, #recipesforbeauty, #salad, #saladdressing, #WHOLE30, vegan. 1. Wash and dry potatoes but do not peel. Cut them into more or less uniform size pieces, which for me was into halves and thirds depending on the size of each potato. 2. Place the potato pieces along with all remaining ingredients in a bowl. No need to stir just yet. Microwave on HIGH for 5-7 minutes depending on the strength of your microwave. 3. While the potatoes cook, preheat over to 400 degrees (Fahrenheit), and spray a cookie sheet with nonstick spray (I used coconut oil). 4. Remove potatoes from microwave and stir well. Then turn mixture onto prepared cookie sheet, being sure to distribute evenly on sheet. 5. 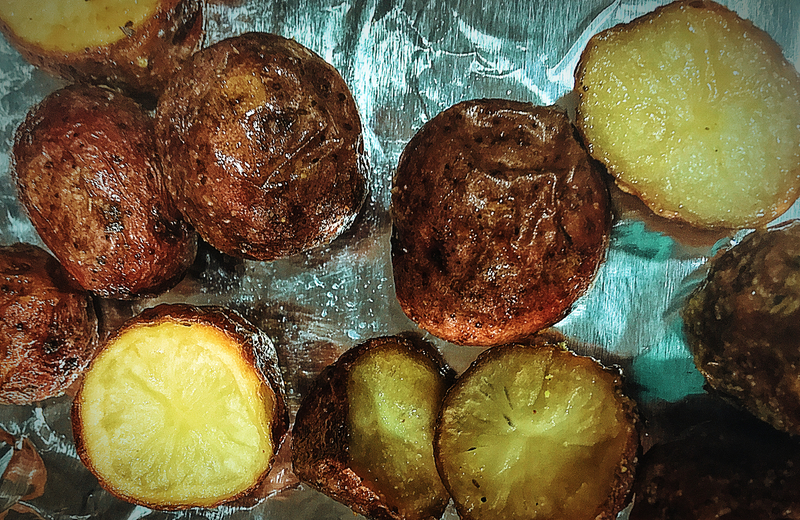 Bake potatoes in preheated oven for 25-30 minutes until desired crispiness. NOTE: These also make great hash browns! This is the day which the Lord has made; Let us rejoice and be glad in it. 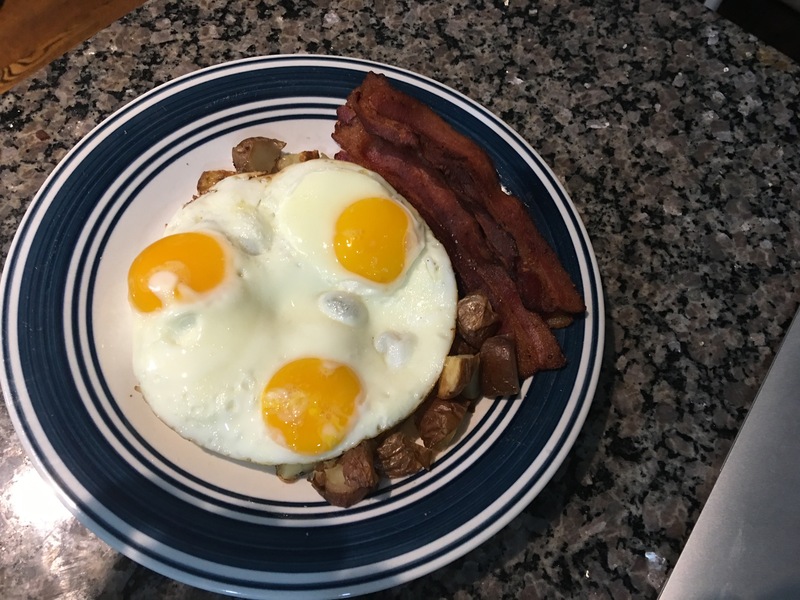 This entry was posted in Appetizers & Snacks, Beautiful Basics, Breakfast & Brunch, Gluten-free Recipes, Pretty Food, Side Dishes, Vegan Recipes, Whole30 and tagged #breakfastfordinner, #dairyfree, #glutenfree, #justeatrealfood, #PALEO, #potatoes, #WHOLE30, Primal.